MyGiftCardsPlus is a site that gives you cash back (in the form of SB points on Swagbucks) for buying gift cards to a variety of sites, stores, and restaurants. You can earn while buying gift cards for family and friends, or earn while buying gift cards towards a purchase you were going to make anyway. For this weekend, MyGiftCardsPlus has rounded up their favorite gift cards for April. Earn Cash Back plus a 100 SB Bonus on Burlington, Panera, Regal, Ulta and Zappos gift cards. The SB Bonus Offers apply to one purchase per gift card listed above. Did you hear the news? 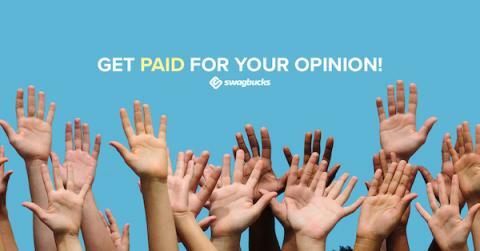 Swagbucks just added another easy way to earn SB. 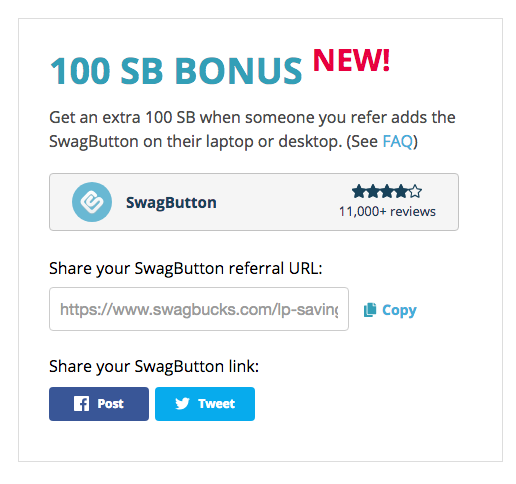 Get 100 bonus SB when your new referral adds the SwagButton to their laptop or desktop browser. You’ll also earn 300 SB when your referral signs up and earns 300 SB in their first month. PLUS, you’ll also earn 10% of their SB earnings for the life of their account. To invite a friend to join and add the SwagButton to their browser, click here. Be sure to click here to read the FAQ’s for this offer. Swagbucks actually works – I have earned HUNDREDS of dollars in gift cards through the years. 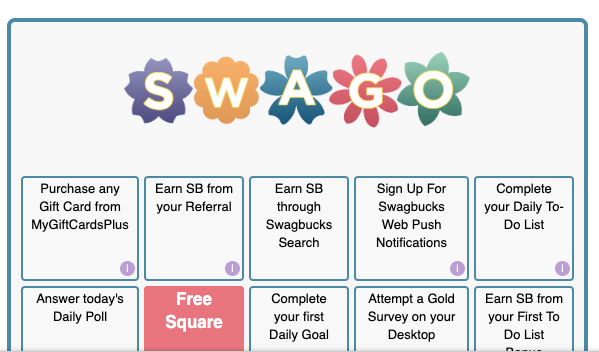 The digital rewards site Swagbucks is offering big payouts during their March Swago Board, which runs from March 11 at 12AM PT through March 16 at 12AM PT. 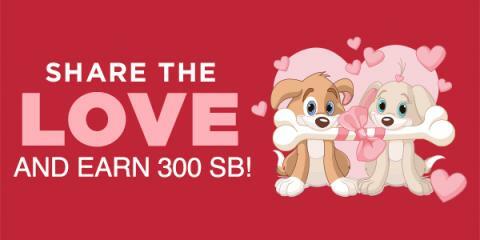 Get 300 Bonus SB ($3 Amazon Gift Card) when you sign up for Swagbucks in March! 2. Earn 300 SB total before 4/1/19. You’ll get a $3 (300 SB) bonus for it . That’s it. It’s super easy, and Swagbucks is for real. I use it myself, and I’ve earned hundreds of dollars in gift cards!